On my plane to Paris 2 days ago I read an article about France banning Lucky Strike Cigarette sales because of some wrong advertising and how all stock will b taken out of circulation. 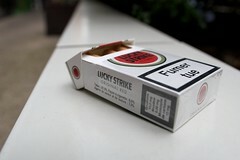 So the first thing I did getting out of the Metro was to find a Tabac a ask for a pack of Lucky's. We have a saying in Bulgaria "Закона е врата у поле", or "Laws are nothing but doors in the middle of the field"